It’s something of an incongruity that one of the most innovative and influential carvers in the United States uses a humble found wood as his medium. 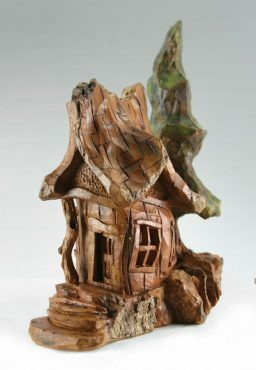 Rick Jensen has been carving cottonwood bark—literally, the thick bark of dead eastern cottonwood trees, which Rick harvests himself in North Dakota—for 30 years. 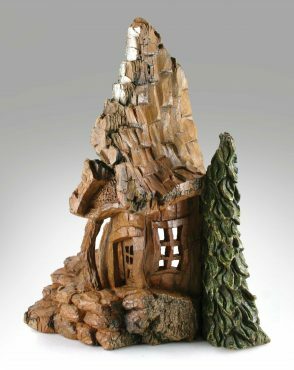 The Minnesota native has been teaching his techniques in classes, at shows, and in print for nearly as long; thanks to him, whimsical bark houses regularly appear at carving shows and competitions around the country. 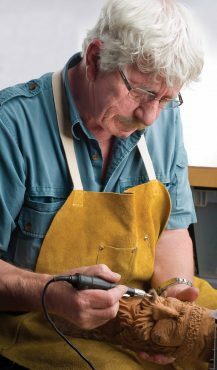 Rick started carving at age 7, when his father gave his first pocketknife to him. He whittled sticks for years, gradually learning to control the cuts. He carved his first decorative piece, a redwood ram, while in high school; Rick still displays the ram at home as a reminder of how far he’s progressed as a carver. 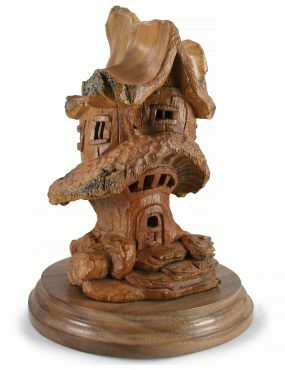 After devoting several decades to family life, education, and the Vietnam War, Rick returned to woodcarving in 1984. Soon after, Bobby and Vicki Thurman of Kansas City, Mo., introduced him to cottonwood bark houses and encouraged his enthusiasm. 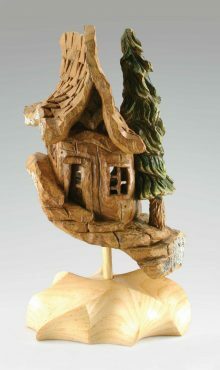 “Bobby and Vicki were really supportive of my whimsical houses,” Rick said. In addition to the Thurmans, Rick credits the legendary caricature carver Harold Enlow with influencing his carving. “Harold taught me how to carve clean, and how to impress people when I carve,” Rick said. Harold taught him to hold an audience’s attention while carving by making dramatic cuts and telling jokes and stories. After the day of classes, Rick took down his display—and John insisted he put it back up. “John told me he wanted me to teach a class on bark carving during the day,” Rick said. 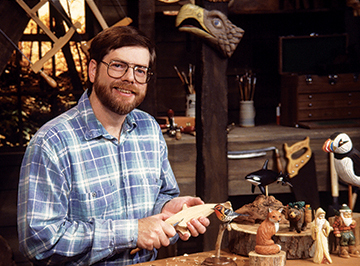 From there, Rick started teaching at other big seminars, including War Eagle Woodcarving Seminar in Bentonville, Ark., and Silver Dollar City. 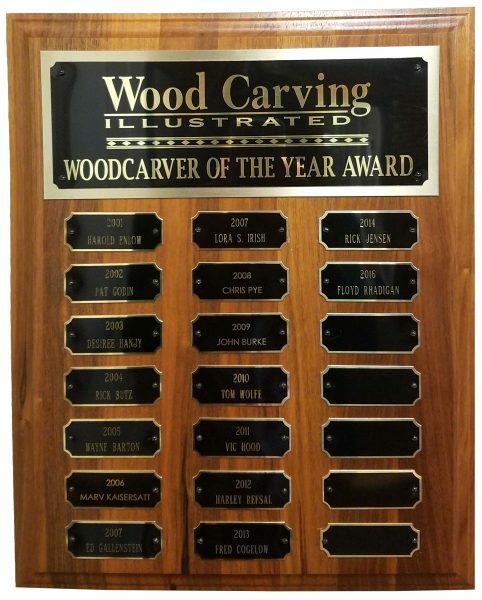 Rick’s work continued to gain popularity, and he was featured in Vic Hood and Jack Williams’ book, Carving Found Wood. Rick’s carvings went over well, so Fox Chapel Publishing asked Rick to write a book about bark carving. Together with Jack Williams, Rick created the Illustrated Guide to Carving Tree Bark. CLICK HERE to visit Rick Jensen’s website. CLICK HERE to purchase books by Rick Jensen.